In July 2014, the standard IFRS 9 was finally completed and the latest amendments brought us new impairment rules (besides the other things). In my humble opinion, new impairment rules will cause a lot of headaches for mainly financial institutions. Well, they will have a hard time to adjust or upgrade their own information systems in order to provide just the right information and calculate loss provision in line with the new requirements. But – even if you’re not working in a financial institution, don’t celebrate that much. Do you have some trade receivables? In such a case, you ARE affected as well. You need to change the way of calculating “bad debt” provision related to your receivables. Let me show you how. Here, we have financially healthy financial assets that are expected to perform normally in line with their contractual terms and there are no signs of increased credit risk. IFRS 9 requires recognizing impairment loss amounting to 12-month expected credit losses. What is 12-month expected credit loss? Learn IFRS financial instruments and many other IFRS topics in our videos! Have you already checked out the IFRS Kit? It’s a full IFRS learning package with more than 80 private video tutorials, more than 100 IFRS case studies solved in Excel, more than 150 pages of handouts and many bonuses included. If you take action today and subscribe to the IFRS Kit, you’ll get it at discount! Click here to check it out! It is the expected credit loss resulting from default events on a financial instrument that are possible within 12 months after the reporting date. In this case, the interest revenue is recognized based on effective interest rate method on gross carrying amount, so no loss allowance is taken into account. When the credit risk of certain financial asset significantly increased and the resulting credit quality is NOT low risk, then an entity needs to recognize full lifetime expected credit losses. They are present value of losses that arise if a borrower defaults on their obligations throughout the life of the financial instrument. In fact, 12-month expected credit losses are just the portion of the life time expected credit losses. The present value of cash flows that an entity really expects to obtain from the financial instrument. As a result, the timing of payments from the financial instrument directly affects their present value and thus the amount of an impairment loss. In practice, if you expect that debtor will pay you in full, but later than in line with the contract, there IS an impairment loss! Interest revenue for stage 2 assets is calculated exactly in the same way as in stage 1 (on gross carrying amount). When your financial asset has already become credit impaired (meaning that certain default events have occurred), then an entity still recognizes lifetime expected credit losses. However, this time, interest revenue is calculated and recognized based on the amortized cost (that is gross carrying amount less loss allowance). In this stage, financial assets might need to be individually assessed. Why is this model so demanding? Even slight change in 1 parameter can affect the resulting amount of recognized impairment loss and thus financial results of an entity. Therefore, it’s everything else but NOT easy to adopt these newest requirements. However, the good news is that unless you work for a financial institution like bank, you don’t have to follow the above general model. There are many entities whose primary business is simply NOT providing loans or finances, but for example selling goods or services. These companies might have huge portfolios of trade receivables in their accounts. Of course, trade receivables do meet the definition of a financial instrument and as a result, they are subject to IFRS 9 as well. And exactly as I wrote above – if you expect your customer will pay you a bit later than agreed, you have an impairment loss on your trade receivable that you need to recognize! But don’t worry, you don’t need to go from stage 1 to stage 3, calculate probabilities of default events and recognize 12-month expected credit losses first, followed by life time expected credit losses. That would be enormous burden for the companies whose focus is something very different. Instead, standard IFRS 9 permits the use of simplification. If your trade receivables do not contain significant financing component, you can recognize lifetime expected credit losses right on initial recognition. Moreover, as a simplification, you can use so-called provision matrix. Let’s take a look at our example to clarify that. One of ABC’s customers, debtor A, filed for bankruptcy proceedings during 20X4. ABC’s receivable to debtor A amounts to CU 2 200 and ABC expects to recover close to nil. The last column of the table contains percentages of expected credit loss in the individual aging groups. ABC estimated these percentages based on the historical experience and adjusted it, where necessary, for forward-looking estimates. How should ABC calculate bad debt provision in line with IAS 39 and IFRS 9? Firstly, let’s try to calculate bad debt provision in the old way, in line with IAS 39. IAS 39 requires recognizing the impairment loss to the extent it has already been incurred. So you are not looking to future expectations or anything like that. Instead, you need to examine just the events leading to impairment loss already incurred. In the ABC company’s trade receivables portfolio, there’s only one such a receivable with incurred impairment loss. Here, bankruptcy proceedings against debtor A would probably represent the default event causing that ABC will not recover its trade receivable. As ABC assumes the recovery close to nil, it can recognize bad debt provision amounting to 100% of the receivable’s gross carrying amount of CU 2 200. Although past experience shows that some percentage of other receivables might not be recovered (look to the 3rd column of the table), ABC can’t recognize any bad debt provision to remaining receivables, as there’s no evidence of impairment loss really incurred. Thus the statistics in the 3rd column is irrelevant for IAS 39 and total bad debt provision in line with IAS 39 is CU 2 200. Here, the things totally change. Of course, bad debt provision to debtor A’s receivable of CU 2 200 will not be any different. This receivable has already been credit impaired and full lifetime expected credit loss is simply 100% of this receivable – CU 2 200. However, what about remaining receivables? Well, based on the statistics in the 3rd column it seems that ABC can reasonably expect some credit loss in the future, although no loss events have happened yet. However, ABC’s past experience shows that ABC can expect 0.5% credit loss on the trade receivables that are totally healthy and performing normally in line with the contractual terms. The percentages increase with increasing days that the receivables are overdue. As a result, ABC needs to recognize bad debt provision based on provision matrix, as this simplification is permitted by IFRS 9. 1 961 + 418.4 + 1 545.6 + 1 174.8 + 1 522.5 + 3 500 = CU 10 122.30. 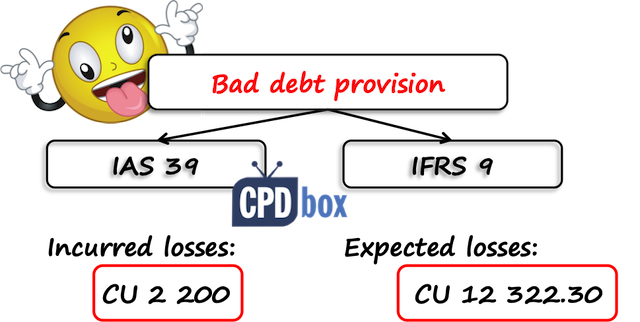 Add provision to debtor A of CU 2 200 and the total bad debt provision in line with IFRS 9 is CU 12 322.30. Hmhm. That’s quite different from IAS 39 provision, isn’t it? OK, so maybe you have just found out that IFRS 9 can hurt you pretty much. What to do? Is there some time to get ready? IFRS 9 will be mandatorily applicable for periods starting 1 January 2018 or later, so you still have some time. However, you can adopt IFRS 9 earlier, if you want. In this case, if you adopt IFRS 9 before 1 February 2015, you can adopt previous versions of IFRS 9, meaning that you can continue with impairment rules under older IAS 39. But not after 1 February 2015 – after that date, your only option is to apply new IFRS 9 in its entirety, if you opt to apply it early. Did you like the article? Do you have anything to say? Please do so in the comment below and help me share this article with your friends. Thank you! Thank you very much for the example on bad debt provision. The only comment I would to make is that IASB is not good at choosing effective terminology eg deferred tax, now lifetime expected credit loss, there are few such. They do define this but it would be musch easier for the reader to get the perspective in mind by reading the key terms itself eg lifetime expected credit loss could have been termed as expected future losses. Things need to be simple not complicated. Unfotunately these confusions remains with some people for life. Honestly, this is a laudable efforts being put in place to ensure that the financial statement prepared are well detailed enough so that more confidence could be put on it. Thank you very much Silvia for clarification .Although I have been red about this in ACCA article ,now it become understandable . I agree with above comment . I love this! It is the reality, fully agreed with the principle of Time-value-of money. As a financial Analyst, am completely in support of the provision of IFRS 9. An excellent article! Keep it up Silvia! Basically, use IRR formula to your cash flows and you’ll be fine. S.
could u help me please how to build migration matrices in IFRS 9? I am sorry, this is totally out of my scope. S.
Thank you very much for your article. I real don’t know why I didn’t see this website earlier.. It is real awesome and I am addictive of IFRS, I always like to increase my practical understanding of these issues.. Thank you very much. I have one comment which needs your clarification. In your bad debt provision example, because the example was on trade debtors hope it is the reason that we didn’t discount them as it is a current asset. What if the ABC Company had a portfolio of loans that matures in say 5 years,on the life time expected impaired model, are we going to discount the amount of impairment loss expected in future but which is going to be recognized this year in our financial statements? Hope it is yes, unless you explain to me otherwise. Please confirm my understanding..
Once again thank you for your nice articles..
well, we did not discount this provision as this is permitted simplification per IFRS 9, but of course, time value of money should be reflected in percentages of loss provision. With regard to loans – you generally cannot use this simplification. In fact, you should calculate the amount of impairment loss for loans as present value of amount expected to receive less present value of amount per contract – so yes, time value of money is reflected in the loss provision. S.
This is a very interesting comparison; indeed the difference between IAS 39 and IFRS 39 is substantial, however, the old style loan loss provisioning under Dutch Gaap was similar to IFRS 9 and gave banks more room for prudent loan loss provisioning and less volatility of P/L. Thanks Silva for this insight. I really enjoy reading your articles. Keep it up. I am grateful. Great Update! I like it, though the new requirements may seem complex, you’ve simplified it in your explanation on how to apply it. Thank you Silvia! Thanks for this precise and insightful notes of the IFRS. I had earlier resolved not to write the ACCA paper p2 due to the complex nature of the standards. However, with this lecture am now confident that i can pass the exams come june 2015. Pls kindly mail me some notes on hedge accounting and IAS 41 Biological Assets. Thank you Silvia for the write up. Sorry about your illness. Please be strong for us. Thank you so much for this post. You make it pretty easy to follow. So lovely. A request, please do a write-up on a possible expected loss model for the banks that can be followed just like what you have done for non-bank entities. Would the Numbers change, if the bankruptcy information only become available after the financial year-end, but before finalizing the annual accounts? In other words can I ignore this fact! I also have the same question as Rajesh. Is there any instance when revenue needs to be adjusted when a receivable is doubtful or certain to be bad? Need to know a scenario 1) when the debt goes bad in the same year revenue was recognised and 2)when the debt goes bad in the year following which revenue was recognised. no, you do NOT adjust the revenue when the debt goes bad (I don’t mean interest revenue here). It does not matter when the debt goes bad. S.
Example of bad debts is really good to understand. Thank you so much. thank you!!!! i finally understand!!!! But imagine that a construction company will apply IFRS 15 an IFRS 9 starting from Jan 2016, they have to recognise impairment losses for expected life of debtors plus they might not be able to record that much revenue like last year as majority of their construction contract terms not including enforceable right to payment for customer so Revenue will be recognised at a paeticular point after completion as per IFRS 15. Is not harmful for FS presentation to apply both in one year and getting Un reasonable comparison with prior 2015 figures. How can we explain it to the management, people are non financial experts. I do understand your concerns. Let me just remind you that you should apply these standards retrospectively (with some exceptions) and it means that you should restate also 2015 figures under the new rules. This needs to be done exactly due to comparability. Hope it’s clearer 🙂 S.
Thank you, I got it, in spite of practically It will require a lot of efforts. Hi Silvia, I like your articles very much. I’m concerned about the matter of interest revenue recognized on the stage 3. IS the difference between the interest stated in the contract and the interest calculated on the stage 3, should be recognized somewhere? Or we just post the new sum ( Dt – accrued interest, Cr – Interest revenue) and forget about the contract terms, am I right? yes, you actually don’t go with the contract terms. In fact, it’s a debtor who broke them, right? So you just book the impairment of a financial asset (loan generated or whatever) and recognize an interest as calculated for the stage 3. S.
First variant – amortize it like nothing happened. I mean the sums should be the same as initially counted. But for me, it seems to be complicated. Second variant – amortize it in some proportion to the interest revenue. If yes, how to calculate it? Or maybe it’s too late right now and I don’t get the obvious things. Hmhm, Kate, do you amortize discount or premium separately? Normally, if you get bonds at discount/premium, you would take that discount/premium into account when setting up cash flows from that instrument and not do any separate entries. Isn’t it? S.
Hi, Silvia. I don’t amortize premium or discounts separately. When we have a bond with Discount, in my country we do such posting for interest revenue. If interest revenue is calculated on the gross carrying amount, everything is OK. In a normal situation, when there is no evidence of impairment, in Dt (Interest to be received or Cash) we will post the sum calculated by the terms of the bond. But if the interest revenue is calculated on the amortized cost, I don’t know exactly how to calculate two sums in Dt, since the interest revenue changes. Provision can be created only if the entity has a present obligation as a result of a past event (IAS 39). There would be no obligation to the company with regard to the debtors then what is the meaning for the provision of the bad debts? I think you are putting 2 things together: the definiton you mentioned comes from IAS 37, not IAS 39 and it does not apply to financial instruments. Also, technically speaking, under IAS 39/IFRS 9, you do not recognize “provision for bad debts”, but an impairment loss on financial assets. S.
Ma’am please put a video lecture too. it will be more helpfull as you are a good teacher and provide the best explanation to every point. So please put a video too. Credit loss and nothing incurred. Hmmm…I see a lot of problems with the tax deduction. In Sweden you have to prove that a loss is at least more likely to occur than not to occur to be entitled to a taxdeduction. Let´s se what the tax courts have to say about it? I think you hit the point. In many countries, there will be tax issues with the impairment provision under IFRS 9. My only advice is to follow your own tax rules with regard to calculating taxable profit and tax. It will often mean to add the expense for recognizing IFRS 9 provision back to the accounting profit and calculating+recognizing deferred tax. S.
How to calculate the provision if we don’t have any historical data for PD and LGD generation? Izad, that’s difficult in this case, but I’m sure that there is at least some industry data or economical statistics in your country that you can use. S.
Your article is very good. But I need get clarify that ,in a bank how we can categorized our portfolio in to thee buckets S-1 2 3( eg whether according to the pas due period or any other method).It is not practice to identify stage individually evaluating. If it is need individually evaluation we have to follow current ISL method and collective assessment. Please clarify. for bigger loans, you would make an individual assessment. For smaller loans, you can do a “portfolio” approach, or a collective assessment. You can group the loans according to their characteristics and assess them on a collective basis – that’s possible and permitted by IFRS 9. S.
Thank you for our reply.Can you further clarify how we can categorized our portfolio in to thee buckets S-1 2 3( eg whether according to the pas due period /time buckets )and whether first we have to separate ISL and collective. this question requires much longer reply that I can do in a comment. IFRS 9 offers the full guidance on this topic. However, maybe I’ll write an article about it in the future. S.
Thanks,you really explained it well. Nicely explained Silvia. Its very understandable and simple. God bless you richly. I have a question regarding receivables from government entities. Why receivables from government entities are usually considered good and these are not provided for doubtful debts. Is there any legal/ logical reason behind that. The reason is that the government is a state and as such is regarded safe (i.e. always paying its debts). It applies for most countries (except for some bankrupt countries). S.
How we treat then receivables from government entities that are default or delayed in collection due to issues in government probably bankruptcy.? As any other receivables that are default or delayed. how to calculate ECL provision, when Past due information of debtors/ retention money or security deposit is not available. Company doesn’t maintain bill wise details of dues in earlier years. you can use both internal and external data for estimating ECL provision. As an example, you can use ratings, credit loss experiences of other companies in your industry for similar receivables, external reports, statistics and IFRS 9 also recommends using “peer group experience” for the comparable financial instrument. S.
As rightly mentioned in this article that Companies can use simplified approach for measuring the expected credit losses for trade receivables. This can be done by using provision matrix. 1. There were no defaults noted in the past. Do we have to consider time value of money while developing provision matrix? if yes, then how? if you have a history or past statistics on average overdue days in collecting the payments, then you should be able to develop a simple model. And yes, of course, you should take the time value of money into account, because that’s the reason why there’s still some expected credit loss (in fact, when your debtors pay you later, then you are losing the interest). This is too complex topic to reply in a comment, but to give you some hints: try taking your trade receivables portfolio at some past reporting date and analyze the losses. How many of the receivables then not overdue were paid on time (no credit loss)? How many of these receivables were paid late and what’s the loss on them (loss calculated as “lost interest in overdue period)? Let’s say you have 1 000 of receivables and 200 of them were paid with 60 days delay. Let’s say your discount rate is 3%, so calculate “lost interest” over 60 days – it’s 1 (200*3%*60/360 as very simplified calculation). In this case, your loss rate on receivables within maturity is 1/1000 = 0.1%. I hope you get the point, although this is very simplified. S.
Could you please give a more practical example with a loan portfolio or one loan contract. An example of say a loan facility with 5 years tenor, to be repaid on monthly equal installment and the loan repayment past due by six months with a collateral security. Could you please give a scenario like the above to calculate the impairment loss and and the effect on the financial statement. I would like to know when do we apply the general model and when do we apply the simplification/provision matrix? Is it a matter of choice? I’m an ACCA student preparing for paper P2. Hi Henry, I think I covered it above in the article, but for simplicity: the life-time ECL model (“simplification”) is applied for all contract assets, all trade receivables all the lease receivables. ECL for all other assets (loans, debt securities…) is measured by general model (12-month ECL and life-time ECL). Your materials are amazingly understandable. Thank you for excellent presentations. My question is related to credit impaired loans (stage 3) interest income recognition. IFRS 9 Stated that we shall use amortised cost as an interest base, but are we have to use amortised value of the principal less than the portion of the impartment related to the principal, or we use the amortised cost (interest + principal) less than impairment. My idea is to keep exact track on the contractual on cortractual receivables and to comply with the interest recognition requirements on IFRS 9. Thank you for explanation. But where could i have the example based on 1 receivable that I expect to gain with monthly repayment and given 1yPD, please? How could I estimate my ECL? for individual receivables, you do not use the provisioning matrix (or percentages). In this case, you are assessing the debtor individually, the probability of paying later or not paying at all and you are comparing expected value of all outcomes with the carrying amount of the receivable. Just a quick example – let’s say there’s 50% probability of debtor facing financial difficulties and present value of recovered receivable would be just 1000. So, expected value of all outcomes is 50%x1000 + 50%x3000 (I assume that present value is 3 600 when the debtor pays on time – normally, you would just look to your books) = 2 000; and you compare this 2000 with your carrying amount to find out the expected credit loss. Great discussion about the IFRS 9. I am just a beginner on IFRS and I am having trouble on how to record the ECL on the books (journal entries) when you are using the general approach. Can you give example for instance a loans receivable for 3 years, what will be the entries: from stage 1 on year 1, then stage 2 on year 2, because of significant increase in credit risk, then back to stage 1 on year 3, because of regained capacity of the borrower. Sorry I am just confused especially on what amounts to be used per year. Hope you can help. Thank you! This is quite insightful, please Silvia keep it up. I dint know that IFRS 9 could be simplified to that level. What a significant difference between IAS 39 and IFRS 9. Thank you once more for the good job. No words to you, The example you gave is very simple that any person can understand and apply. Thanks a Lot and long live. 1) Is the Default rate / Loss rate to be calculate on yearly basis and apply or fixed initial time and use in future periods? 2) And in case our assumptions are went wrong and Company recovered full amount (no Bad debt) in subsequent period, can we reverse the Impairment, if so as what line like income?. Thanks in advance for your reply. By the way, here’s the article where you can learn more about setting the default rates. S.
1) You should revise and update your estimates including the default rates periodically, so yes, annually. 2) Sure, you can reverse the impairment loss. S.
Now Q1 2018 finished and the auditor asked us to provide impairment for deposits in banks and cash!! most of the deposits are short term. my question is how come dposits impaired? please note that Central Bank of Kuwait guarantee all client’s deposits in Kuwait. Hi Ahmad, if these deposits are current… then you should probably ask your auditor for the explanation. S.
This IFRS 9 give an entity to adjust its profit by applying an adjusted percentage for each line of ARs Past due days, Does this approach allow companies to manipulate the profit figure (especially for Tax purposes)? Hi Silvia, Regarding for the example given above, would it be possible the “% of expected credit loss” for all the aging category would be “Zero” based on the ABC assessment and conclude that none of the customers are not paid in the past and ABC is confident that all the outstanding amounts are collectible (included long-overdue invoices) in the future? Hypothetically yes, as soon as you also can say that the forward looking information confirms the trend. Please discuss about how bank make provision based on IFRS 9 with practical illustration?? Hi Ank, well, this is really not for an article, because it’s not that easy. But maybe you can find some inspiration here (although not for a bank). My query relates to the Stage 3 ECL provision and interest income being based on the net carrying amount of the financial asset (as opposed to the gross carrying amount for Stages 1 and 2). From an IFRS 9 recognition requirements perspective, I understand that interest income needs to be recognised on the net carrying amount of the financial asset. However, from a business/commercial perspective, the customer/debtor is still billed interest based on the gross carrying amount of the financial asset. As a result, I would imagine that an adjustment needs to be made to interest income (i.e. reducing the business/commercial interest income recognised to reflect the IFRS 9 stage requirements). However, my concern is when the customer/debtor pays their account which was provided for (ECL provision based on stage 3). When such payment is received and it is for the full balance billed (i.e. interest income based on the gross carrying amount of the financial asset), how should one account for the difference between such payment and the customer/debtor balance recognised (i.e. based on the IFRS 9 stage 3 requirements, particularly the reduced interest income)? As a very simple example, say the gross balance was R100 and the ECL provision R20 (Net carrying amount being R80). The interest billed would have been R100 x 5% = R5, but interest recognised would have been R80 x 5% = R4. My assumption would be that the contra account is interest income since it was understated as a result of the IFRS 9 stage 3 requirement to use the net balance to calculate interest, but this is only an assumption. Do you perhaps know one should go about the accounting of my concern raised? Apologies for the long-winded scenario but I needed to be as clear as possible. Silvia, why do you think that impairment loss shall be recognised at initial recognition? IFRS 9 states that at initial recognition a financial asset shall be measured at fair value plus transaction costs, isn’t it? (a) when an entity prices a financial instrument, part of the yield, the credit risk premium, compensates the entity for the credit losses initially expected (for example, an entity will typically demand a higher yield for those instruments with higher expected credit losses at the date the instrument is issued). Consequently, no economic loss is suffered at initial recognition simply because the credit risk on a financial instrument is high at that time, because those expected credit losses are implicit in the initial pricing of the instrument. (b) for most financial instruments, the pricing is not adjusted for changes in expected credit losses in subsequent periods. Consequently, subsequent changes in expected credit losses are economic losses (or gains) of the entity in the period in which they occur. Oh yes, you are right of course, the last part of sentence was referring to purchased credit impaired assets because you recognize the impairment loss on these assets right at initial recognition. I forgot to delete it. Thanks for the correction! Do we need to calculate impairment on advance against which we will receive inventory? Hi Fahad, well, advances for inventory are not financial instruments, unless you expect to receive cash. 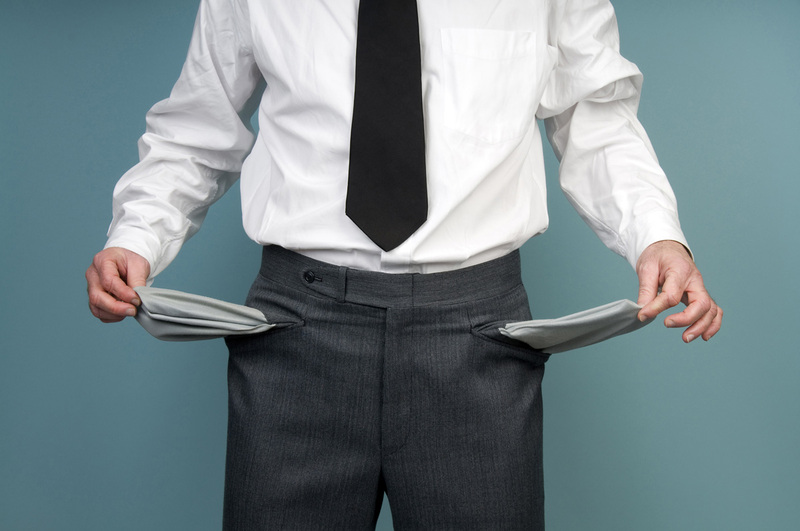 But, you should still assess the advance paid for the impairment in case that your supplier is bankrupt or so. Stage 3 model is similar to the individual impairment which was discussed under IAS 39 ? Can we apply stage 3 for credit impaired retail loans which are not individually significant ? Could you please provide me with a practical example on loan loss impairment calculation for development banks? well, this would be too elaborate to do this online, but we have a great online advisory service, so drop me an e-mail if interested. S.
Dear Silva, please can you help with an illustration on practical application and how to obtain required information for ifrs 9 expected loan loss provisioning for Banks. Hi Dickson, this is a very specific topic, so I would kindly recommend checking out our online advisory service my Helpline. S.
First of all, I want to celebrate all of you with welcomed New 2019 year. Also Thanks for amazing article. I have a couple of question relating to impairment AR. a) how we account for inter-group loans in line with IFRS 9, especially its impairment. As you know, Intra-group loans within the scope of IFRS 9 are required to be measured at fair value on initial recognition. Intragroup loans are often either interest-free or they are provided at below-market interest rate. The amount lent is, therefore, not fair value. In this case, how we account for impairment loss on inter-company loans? b) According to the IFRS 9, simplification of impairment on trade receivables is allowed but after calculating provision matrix, it would be adjusted based on forward-looking estimates if correlations exist between AR and macro-economic factors. Ok, but how we can calculate correlation between those. Can you describe briefly this calculation? Because, I am required to do provision matrix in line with IFRS 9. Thank you for always updating the changes in IFRS in simple way. This is a brilliant web-site and is extremely useful and clear to understand. Your ability to simplify complex concepts is a gift. Do we need to differentiate between “credit risk” and “dispute risk” when applying the expected credit loss model for provisioning of trade receivables. Essentially, any risk of recovery on account of disputed bills by the customers owing to delivery/performance issues by the entity will be treated differently from actual credit risk? In which case for dispute risk- the treatment may be provision created as a net from revenue. Hi Ashraf, I haven’t thought about it, but if you have more dispute cases, then I would probably separate or segment the receivables to disputed and undisputed and calculated ECL separately for each segment. It makes sense. i am implementing IFRS effective 2018, is it permitted under IFRS 9 to route the provision resulting from ECL calculation through P&L in 2018 and not through adjusting opening Retained Earnings for those receivables were outstanding as of 31st December 2017?